The chia seeds were a new addition and since they absorb so much liquid I added in more applesauce to keep the oatmeal from being too dry, it is already a bar like oatmeal. Heat the oven to 350°, spray a 9×13″ glass baking dish with cooking spray. 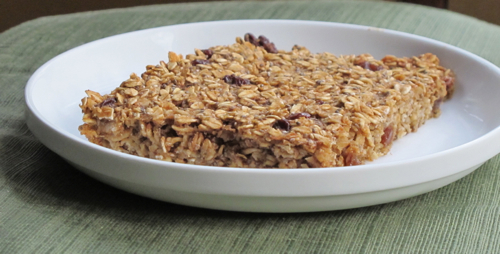 In a large mixing bowl combine the oats through raisins. In a medium mixing bowl whisk the milk through vanilla together, pour over the dry and stir till mixed. Scrape into the prepared baking dish, pat smooth and bake for 40 minutes. Eat warm or let cool and chill in the refrigerator. Reheat in the microwave uncovered for 1 to 2 minutes on high (it stores well for a couple of days for easy breakfasts). 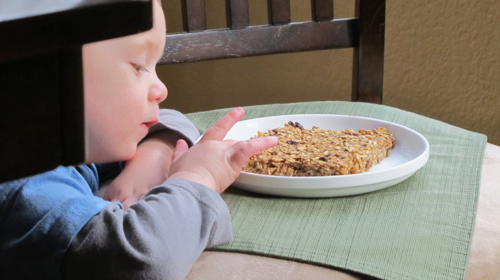 And a little hungry bear wandered by….